According to a new market report published by Transparency Market Research titled “Smart Antenna Market–Global Industry Analysis, Size, Share, Growth, Trends, and Forecast, 2018–2026,” the global smart antenna market is projected to expand at a CAGR of 8.4% during the forecast period 2018-2026. According to the report, the global market will continue to be influenced by a range of macroeconomic and industry-specific factors. Increasing application of smart antennas in smartphones and growing demand for smart antennas in wireless communication has increased the penetration and growth of the smart antenna market globally. Cellular system is expected to continue to be the leading segment globally during the forecast period due to increasing demand for smart antennas in wireless communication. The segment is projected to expand at a significant CAGR of 8.7% over the forecast period 2018 to 2026.Smartphones have become a viable alternative to laptops and personal digital assistants (PDAs), offering features such as SMS and voice messages coupled with multimedia functionality, internet applications, inbuilt GPS capabilities, and high data processing capabilities. Moreover, growing need for faster data transmission in modern communication systems with high speed downloading and web browsing has forced companies to increase the efficiency of wireless transmission. This is positively impacting the growth of the global smart antenna market. WiMax system segment is projected to expand at a significant CAGR over the forecast period. WiMAX technology performs a variety of tasks at a time such as offering high speed internet, providing telephone service, transformation of data, video streaming, voice application etc. North America accounted for highest revenue share in 2017 due to concentration of leading manufacturers and increasing demand for smart antennas. In North America, market players are continuously taking efforts to introduce smart antennas with various advanced technologies. Furthermore, growing adoption of radio frequency identification and ultra-wideband technologies is helping the North America market to generate significant revenue. The market in the U.S. held the highest share in 2017 in North America and is estimated to expand at a considerable CAGR during the forecast period. The market in North America is expected to expand at a significant CAGR during the forecast period. 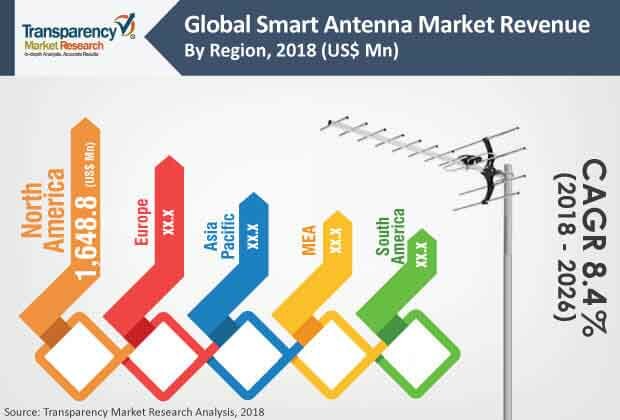 In a number of European countries, advancements in the domain of wireless connectivity and huge investment are fueling the smart antenna market growth. The market in Europe is likely to witness significant CAGR growth over the forecast period. The U.K. contributed highest share to the Europe smart antenna market in 2017. Demand for smart antennas in APAC is likely to remain concentrated in China and Japan due to the growing popularity of smartphones and increasing government expenditure. The market in India is estimated to expand at the highest CAGR during the forecast period due to the growing adoption of modern communication systems with high speed downloading. In Middle East & Africa (MEA), market players are increasing their investments to expand their physical presence. GCC countries are expected to expand at a significant CAGR during the forecast period due to the development of cellular networking technologies in the region. In South America, Brazil is expected to hold a significant portion of revenue of the market throughout the forecast period. The company profiling of key players in the global smart antenna market includes company overview, major business strategies adopted, SWOT analysis, and market revenues for years 2015 to 2017. The key players profiled in the global smart antenna market report includes Cobham Antenna Systems, Intel Corp., Samsung Electronics Co. Ltd., ArrayComm LLC, Alcatel-Lucent International Holdings Inc, Motorola Solutions Inc., Broadcom Corp, California Amplifier Inc., Accel Networks LLC., and Jiashan Jinchang Electronics Co., Ltd. Various players are introducing technologically advanced smart antennas and establishing partnerships with other players to meet the continuously growing demand for wireless communication technologies. The Smart Antenna – Global Industry Analysis, Size, Share, Growth, Trends, and Forecast, 2018 – 2026 report provides analysis of the smart antenna market for the period 2016–2026, wherein 2018 to 2026 is the forecast period and 2017 is considered as the base year. Data for 2016 has been included as historical information. The report covers all the trends and technologies expected to play a major role in the growth of the smart antenna marketover the forecast period. It highlights the drivers, restraints, and opportunities expected to influence the market growth during this period. The study provides a holistic perspective on the market’s growth in terms of revenue (in US$ Mn) across different geographical regions, namely North America, Europe, Asia Pacific, Middle East & Africa, and South America. The report highlights the key trends affecting the market on a global scale. Furthermore, region wise prominent countries/regions covered in the report includethe U.S, Canada, Germany, France, U.K., India, China, Japan, GCC, South Africa, and Brazil.